My name is Chris “Chickenfat” LeBlanc, currently I am Thru-hiking the Pacific Crest Trail after completing the Appalachian Trail last year. The Appalachian Trail was one of the most difficult experiences I have ever had. Day after day I was tested, mentally and physically over my four and a half month journey as I traveled down from Maine to Georgia. Which bring me to my point. The Pacific Crest Trail is a different beast than the Appalachian Trail, its climbs less steep, its peaks much higher, and its weather more desirable than the Appalachian Trail. As a North Carolinian it saddens me that my trail fails to top the Pacific Crest Trail in any category that doesn’t involve privies or town proximity. However I don’t believe this needs to be the case. What I propose is a three part plan which can be utilized on our North Carolina Appalachian Trail lands which eventually could be adopted towards the all trail lands in the future. 1. Create bridges between mountains, to lessen the Pointless Up and Downs (P.U.Ds) that plague the Appalachian Trail. The Appalachian Trail, despite being 400 miles shorter, gains more elevation over its length. This means that during the trail it is seldom flat, and you are constantly subjected to going up or down at an interval that seems like it was set by a child in an elevator. What I am suggesting is the construction of bridges between mountains to create a trail that is more of a leisurely experience instead of the hellacious, calf burning, shirt saturating, religion questioning, existential crisis inducing trail which the Appalachian Trail currently is. 2. Create towers at the top of each mountain to give hikers views. Too often on the Appalachian Trail a hiker climbs a hill and is rewarded with the spectacular mind numbing sensation that only can come from being surrounded by trees. It seems as if the creators of such trail routed them intentionally to avoid ledges, waterfalls, and rock viewpoints in order to remind the hiker that trees will be their reluctant companion like Robin to Batman and no matter how hard the hiker tries, trees will stick to his side, and bring him down. By creating towers on top of every summit the hiker can be sure that his hard work will pay off fruitfully. Furthermore these towers could become Meccas for businesses to flock to, imagine walking up hill for two hours just in time to catch the sunset and order a Big Mac or a Frappuccino from restaurants who would pay a King’s Ransom to have a constant stream of hungry and thirsty hikers. 3. Construct a giant umbrella to place on these towers so that hikers won’t be plagued by the temperamental weather of the East Coast. The Appalachian Trail is much wetter than the Pacific Crest Trail. Rainstorms are a constant concern for hikers who often become so saturated during the hike that many turn into puddles and become part of nature. In order to keep hikers dry, and prevent the ocean from overflowing because of an excess of the “puddle hiker” phenomenon, I propose the creation of mile wide umbrellas to be placed atop each tower. Not only would these umbrellas provide shelter to hikers during storms, these umbrellas instantly become a symbol of North Carolina. North Carolina could become a state where nature and technology meet at the perfect intersection like The Golden Gate Bridge in San Francisco or the Biodome in the Paulie Shore Classic movie. I am a realistic man, and a realistic hiker and while I realize that these will be costly construction projects they will turn out positively for the North Carolina in the end. I have done calculations and estimated that just in tourism revenue North Carolina stands to gain a billion, nay a Gillion dollars in just the first 4.7 years. 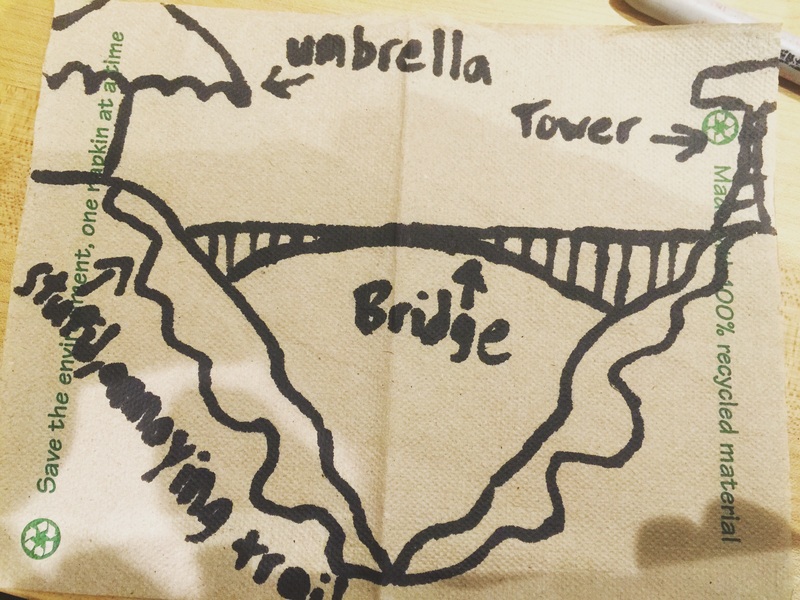 Included is a drawing of how to the proposed changes to the mountain would look. Thank you for your time, and may every day be as serious as today.